This fun wavy slide is great for any child. The slide is designed to fit the frames and is in an attractive blue colour. This length slide is suitable for all of the frames and play centres. This slide is made from sturdy plastic and will last for years. *Please Note: This accessory is only available when purchased with a frame. Plymouth log cabin measuring 5x5m (16'4 x 16'4) built using 68mm logs and ideal for use as a large garden office. Our impressive Ryton is the toughest and most robust wooden shed we offer. The 18mm flooring and substantial roof trusses allow you to store heavy tools or equipment. 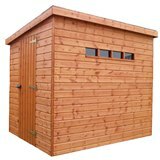 The price for this quality wooden shed includes free delivery and installation in the Midlands area. We can deliver to other areas. Accessories for the Action Climbing Frames - Endless Hours of sailing fun with this Ship Plastic Steering Wheel and off we go! The Denby Summerhouse 8x8 is manufactured with redwood tongue and groove roof boards and is supplied fully installed. The Lawnhouse features double doors and has two fixed windows to the front.